Leaving Baga Gazriin Chuluu meant that I was now traveling south into a part of Mongolia that I had never been to and really knew very little about. Perfect. 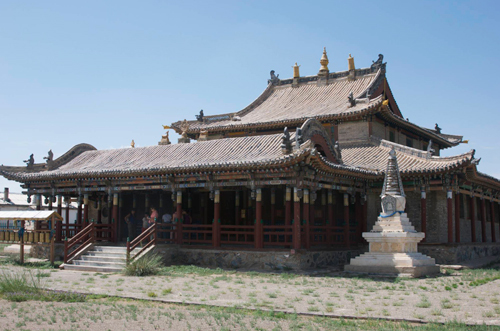 Our first stop was in the soum center of Erdenedalay, home of the Gempildarjaalin Monastery, which was built in 1910. 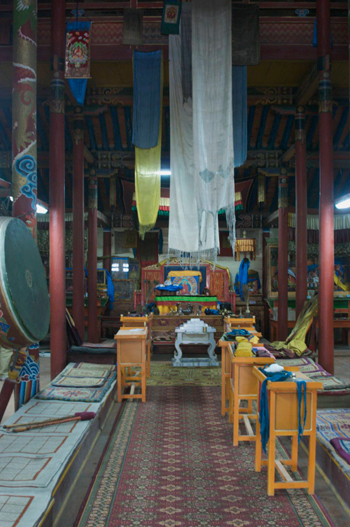 The main temple survived the destruction of the late 1930s and there are now ten monks in residence. 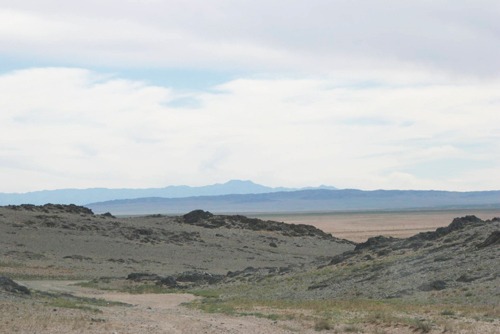 Our road then continued out across the Gobi. The landscape was rolling and surprisingly green. We could see a storm front with rain off to our right. Our final destination for the day was the river valley of the Onglyn Nuur (River), which is also home to the ruins of Onglyn Monastery. 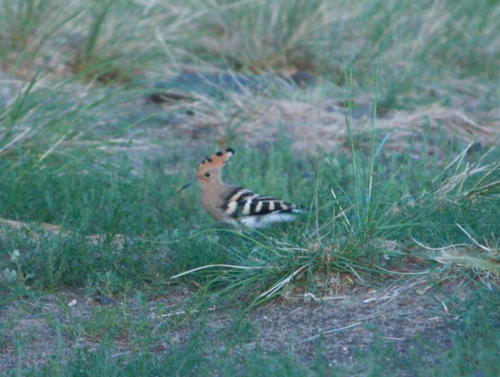 Khatnaa and I went for a birding walk in the early evening and saw some hoopoes, one of the most elusive birds to get close-up photos of. 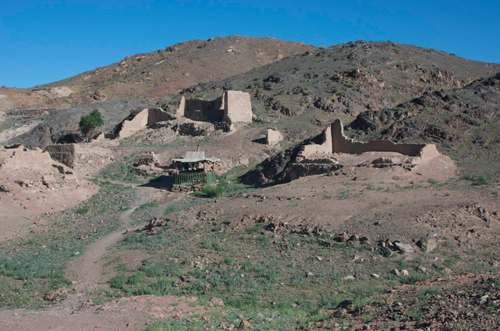 The next morning we walked the short distance to the monastery ruins, which were actually two separate establishments, one founded by a prominent lama in the 1760 and the other by one of his students in 1800. 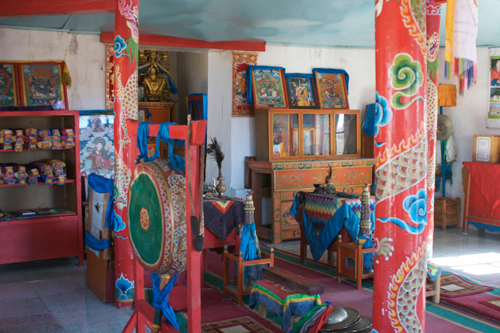 They were two of the largest monasteries in Mongolia, capable of housing up to 1000 monks. All the buildings were destroyed in 1937. Two hundred monks were killed. Many were put to work for the communist government. Some escaped by becoming farmers. 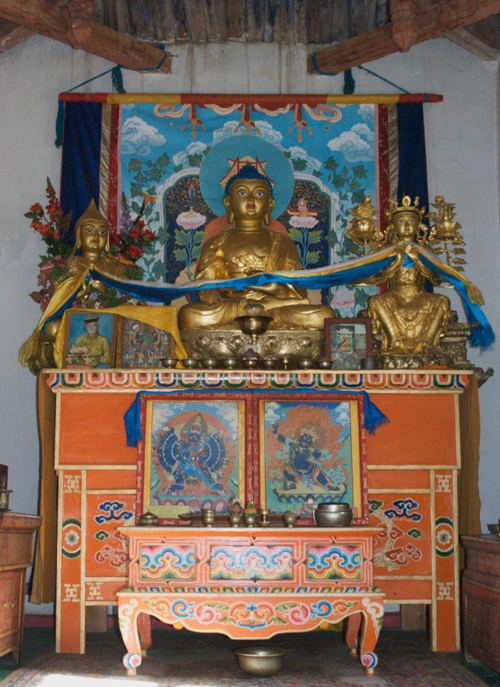 A new, small temple has been built and there are now some monks in residence at the site again. 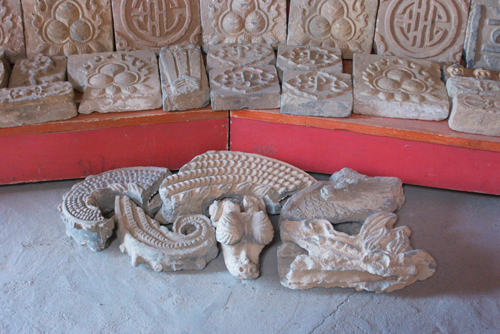 There are also ambitious plans to re-build a major temple. 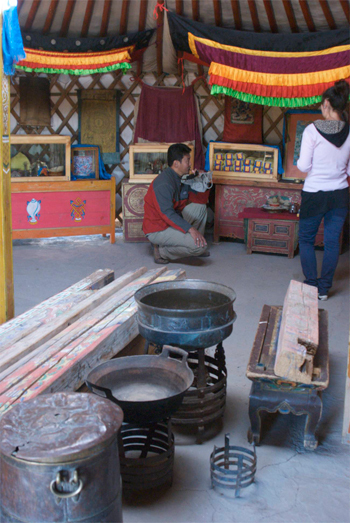 Not far from the temple is a ger which houses a small museum of artifacts that have been recovered from the ruins. I found it very poignant. 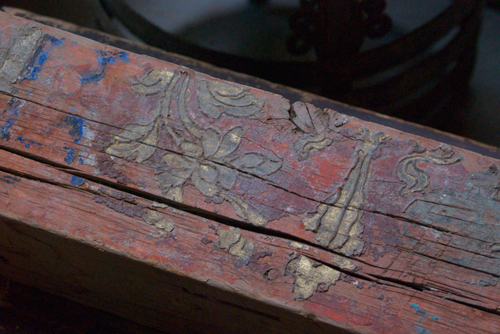 So much beauty, wantonly destroyed. On a happier note, we stopped in at the Secret of Onglyn ger camp and Khatnaa arranged for us to take real showers! It being the morning and the water being heated via a solar system, they were going to be cool, not hot, but it really felt good to remove a few layers and get my hair washed. 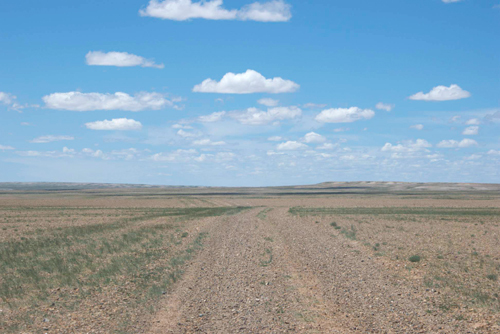 Back on the road, the green had disappeared and become the almost bare, gravelly ground that the Gobi is known for. 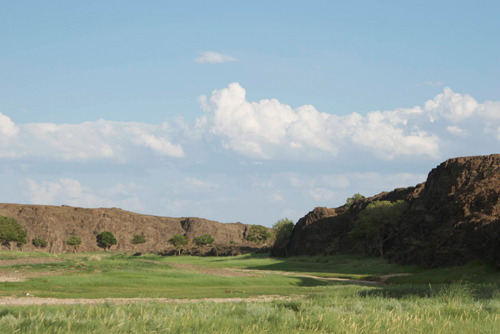 We also drove up and over rock formations that reminded me a little of those at Ikh Nartiin Chuluu. In the late afternoon, we stopped at a town called Guichin Us to re-fill our water containers from the well. This became a regular feature of the trip, stopping at a local well for water, which Soyoloo then boiled so that we could use it for drinking. We drove a few kilometers out of town, onto the open plain and stopped for the night. One of the remarkable things to me was the spots that Khatnaa often chose for campsites. He almost never sought out a sheltered spot of any kind. What seemed to matter was having a slight slope so that if it rained, the water wouldn’t gather under the tents. 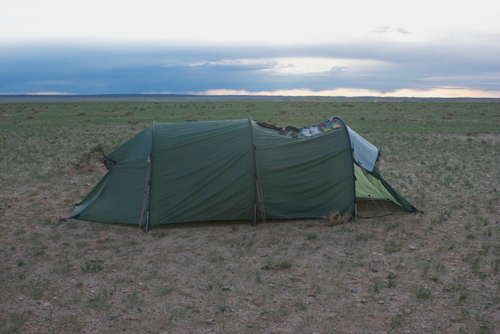 So here’s my tent out in the “middle of the Gobi”, complete with my drying laundry. It was really, really quiet and we sat after dinner watching a distant thunderstorm, hoping that it was dropping badly needed rain on the land beneath. 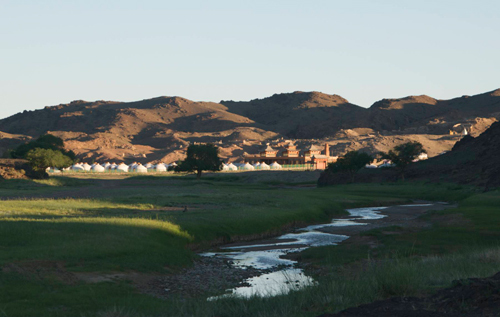 Next up: crossing a flooded Gobi river, bactrian camels and “mosquito heaven”.